Picking out a hair style for your son or daughters wedding is always so nerve wracking. I wanted to write this blog post to help other MOG and MOB when deciding on the perfect wedding hair style. If you are savvy in the tech world you have access to so many visuals from Pinterest, Google, wedding websites like The Knot, Style Me Pretty not to mention all the Red Carpet celebrities giving you a glimpse at what is trending with hair and makeup; think Susan Sarandon, Meryl Streep, Julianne Moore, Diane Keaton or Michelle Pfeiffer all walking the Red Carpet with styles that compliment their age. 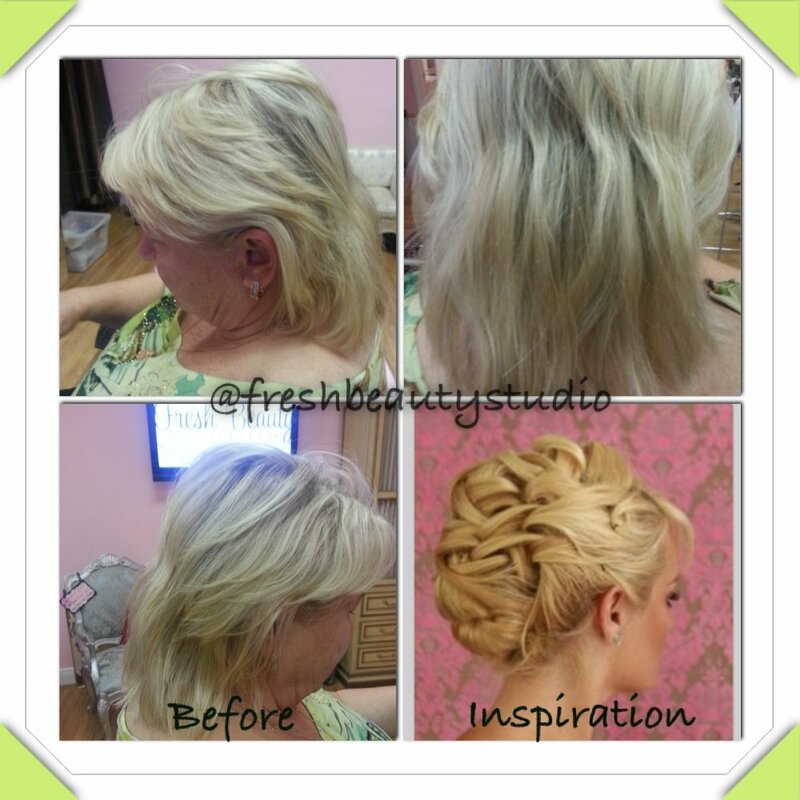 Here is a simple breakdown on what to expect when you book your hair and makeup trial at Fresh Beauty Studio. First, I like to first schedule a consult with my Mothers to understand what type of hair I am working with, Do you need hair extensions to create the hair style of choice? 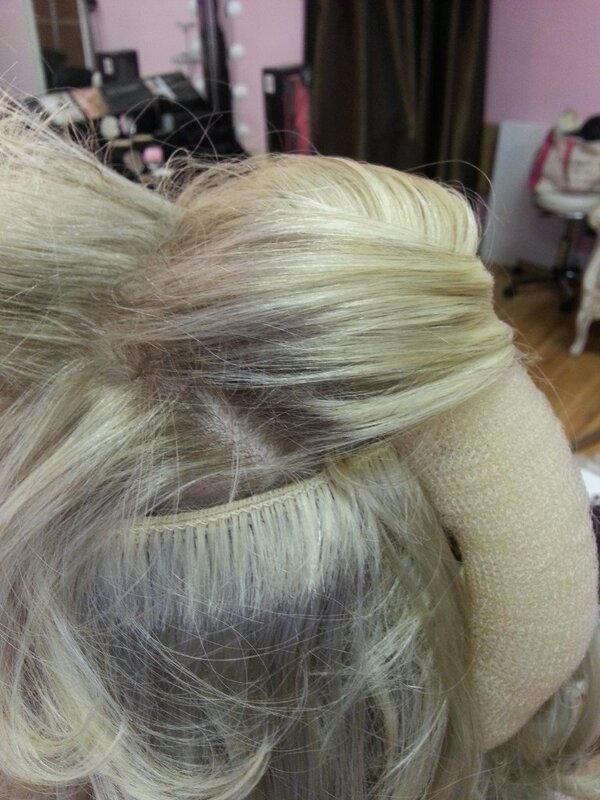 If so, we can custom match your color in the studio and prepare your hair extensions for your next appointment. Sometimes there is a little more work that has to be done such as dying the hair extensions to get the exact color or cutting the extensions. This is what I did with my client Abby, she first came in a couple of weeks ago for her consult, we went over her visuals that she pulled from Pinterest, talked about having realistic expectations when it comes to updo’s. Sometimes there are updo’s that look amazing on the models but when translated to your hair thinness/thickness/length/color etc it doesn’t look the same or just can’t be achieved exactly like the picture, modifications are set in place to give you the same look and feel. Abby came back today for her hair updo trial, this is so important to try out the style before the wedding day, you don’t want to be experimenting with anything beauty related on the wedding day. My advice from the very first day I opened Fresh Beauty Studio was simple: answer your bridal suite doorbell in your comfy PJ’s, sit back and enjoy this exciting day with no stress from running around to salons, spas etc, and sip on a glass of champagne while you have your hair and makeup team arrive to make you look gorgeous. I haven’t deviated from this advise in 8 years and I have seen what happens when the Bride or bridal party does. It’s just not worth it to have that extra stress on such an important day. Here is the inspiration pictures that Abby sent me from Pinterest that she wanted to create. 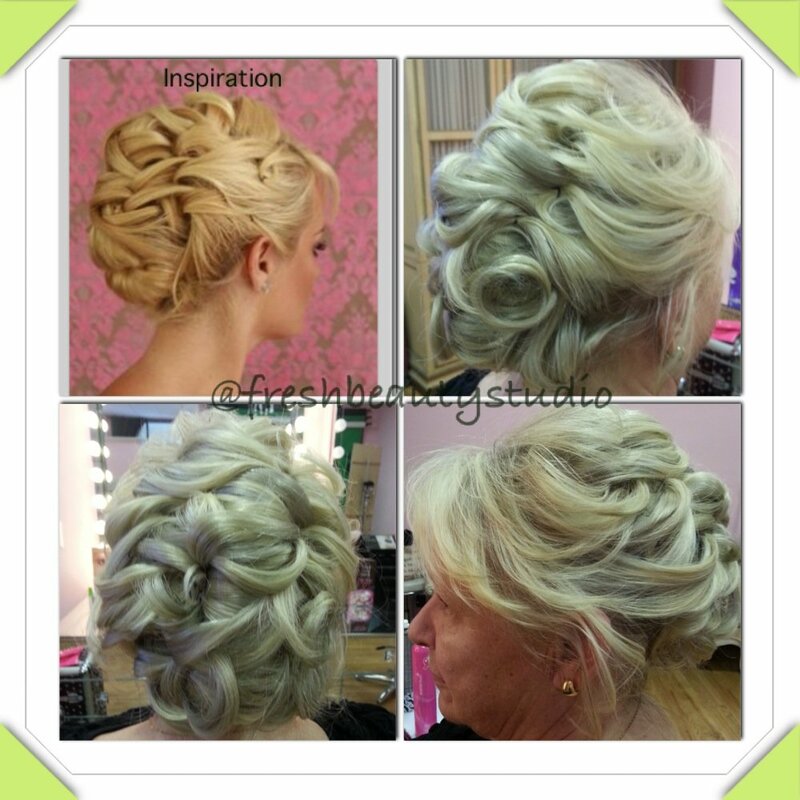 Inspiration from my client on how she wanted her hair to look on the wedding day. I created a collage for you to see what Abby’s hair looked like before on the day of her consultation. I was able to color match her hair for her extensions, have time to dye them to perfectly match her hair and to pre set them before her hair trial. Abby’s Hair Before on the day of her consultation. There is a little more work to be done when you want to create a style that your natural hair just can not do. As you can see in the inspiration picture the model has a lot more hair than Abby does and longer layers. Abby has thin hair with short choppy layers throughout her head. 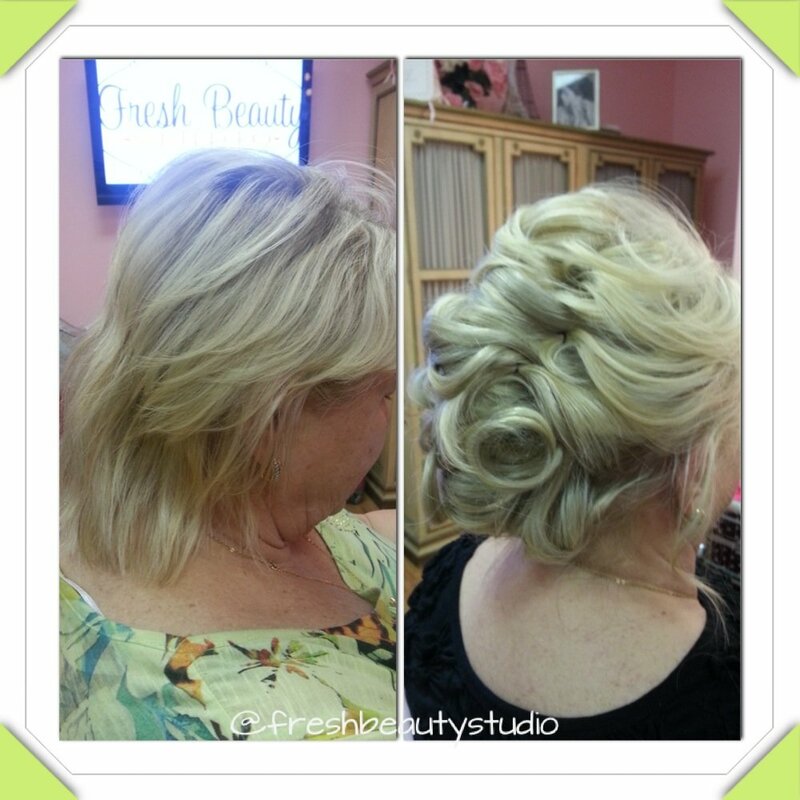 I used clip in extensions that were 14 inches long and I added in a bun tool that snaps to make for a round circle. I didn’t need it for a bun so I unsnapped it and used it vertically securing with bobby pins on the back of Abby’s head to create the base for her volume. Custom extensions and volume tool to help create Abby’s final look. Abby was thrilled with the final results of the updo. She felt that the hair style was secure and that she could dance the night away feeling glamorous. A look back at the before and after. Marianne Shows liked this on Facebook. Tracy Beck Roddy liked this on Facebook. Darlene Orlando Sanchez liked this on Facebook. Nikki Linsley Kridlow liked this on Facebook.